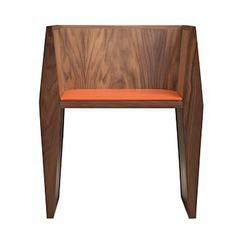 The Lola chair mixes elegance and comfort. Perfect for your dining room. The antique natural shagreen legs are unique and subtle with it's indentation details that complement the overall piece. 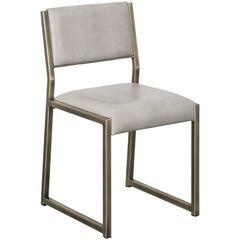 The seat is upholstered in a luxurious soft cream linen fabric. Custom color/sizing available on request. · Handmade. · Shagreen · Measures: 55 x 44 x 97 cm / 21.5" x 17.25" x 38.25" · Wipe clean with soft dry cloth. Acclaimed design duo Ria & Yiouri Augousti have established themselves since the 1990s as pioneers of modern-vintage style through their luxurious Art Deco inspired collections. The Paris based label has distinguished themselves since their launch, with their iconic use of shagreen mixed with brass and other exotic materials. All furniture is handcrafted by skilled artisans, ultimately making each piece unique. All shagreen-covered items should be kept out of direct sunlight, color variants may occur on the stingray and other exotic finishes, but this showcases the Parisian label's commitment to creating authentic luxurious products using natural components. Ria & Yiouri Augousti early and rare occasional chair. France, 1990s. Exotic wood, abaca fiber 16 W x 22 D x 43 H in Sh 18". 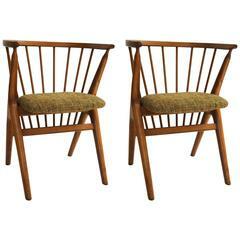 A handsome English faux bamboo chair, featuring a turned wood back and leg supports, with upholstered seat of fine Thai silk from the Jim Thompson collection. 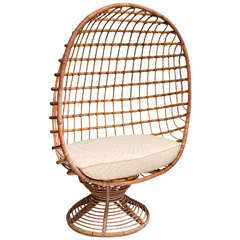 Enclosed woven bamboo canopy chair with upholstered seat cushion.